Etendeka - the land of the layered hills in Namibia's Damaraland. The land of the wide open spaces, rugged natural beauty and vistas that go on forever. The land where time stands still, where the modern world and its cares are forgotten, where the plants and animals have evolved side by side with their environment over millennia. 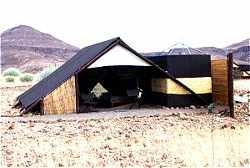 The Etendeka Tourist Concession comprises an area of 50 000 ha in the foothills of the Grootberg on the edge of the rocky Namib Desert. The ancient basalt has been eroded into a dramatic landscape of flat-topped hills and plains strewn with weathered boulders. The concession is part of the old Damaraland where the wildlife, living alongside nomadic pastoralists, is truly wild and free to roam uninhibited. The sighting of Hartmann's mountain zebra, oryx, springbok, giraffe or perhaps even the desert adapted elephant or black rhino may add an exciting bonus to your stay. Evidence of these animals, however, is often seen, along with less conspicuous inhabitants - reptiles, small mammals, insects and other arthropods. Many of Namibia's endemic birds occur here, such as Herero Chat, Monteiro's Hornbill, Ruppell's Korhaan and Rockrunner. An average annual rainfall of around 100mm supports scattered and often thick-stemmed desert-adapted trees and shrubs and varying grass cover. Here you will meet the "Etendeka Big Five" trees. Etendeka Mountain Camp offers a unique, pristine wilderness experience which will appeal to photographer, naturalist, astronomer and geologist alike, as well as lovers of peace, quiet and open space. To get the most of your experience you will need to spend at least two nights here. With a maximum of 16 guests, each guest is assured personal attention in a relaxed atmosphere. At Etendeka we strive to be at one with our environment, bringing you as close to nature as possible without compromising on safety or comfort. Solar heating and electricity do not disturb the silence. All plants and animals found around the camp are indigenous to the area. 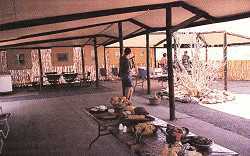 Each of the ten walk-in, shaded tents at Etendeka Camp is equipped with two beds, linen, towels wash basin, a bush shower with hot and cold water, a flush toilet and electric light. Water is of high quality, but in short supply so laundry is not done at the camp. The daily tariff includes a two course dinner, continental breakfast, lunch, afternoon tea, a full bar, a transfer to the camp, guided nature walk and scenic drive. Access to Etendeka Mountain Camp from the public road is by 4x4 vehicle through rugged terrain. Guests are met at the transfer point. The transfer, which takes one and a half hours, gives guests a good introduction to the area - so have camera and binoculars ready! Our private air strip is only twenty minutes from camp. WHAT TO BRING: Dress is casual. The weather is generally mild to hot throughout the year during the day. Evenings are often cold, even in summer, so always bring a jacket. Good walking shoes or boots are essential, as are a hat and sunscreen. Binoculars are recommended. A water bottle and walking sticks are provided. For most of the year relative humidity is extremely low, and strong, warm winds can be experienced in winter. Isolated thunder showers may occur between October and April, but the majority of the rain falls from January to March. HOW TO GET THERE: Access is by reservation only. Take C43 from Khorixas or join it from the Skeleton Coast Park, or C40 from Kamanjab. Turn west along C40 towards Sesfontein and follow the sign boards to the pick-up point. Transfer time is 15h30 in winter and 16h00 in summer. AIR STRIP CO-ORDINATES: Our private gravel airstrip has a total length of 1000m and an altitude of 3000 ft at 19° 47.53 S and 13° 56.14 E.
ELECTRICITY: 220VAC is available for charging video cameras only. All other eccentricity is low voltage DC. Activities offered: Nature/game drives and walks, Telescope, Transfer from/to the veterinary gate. Pick-up time: winter: 15h30! Summer: 16h00! Facilities offered: 8 tents each with bucket shower and toilet, restaurant and bar. Please note: Etendeka is closed every year between 23 December and 01 February. Children over 7 years old only!